I am so excited to co-host the Fabulous Friday Link Up Party with the Fashion Over 40 Fashionista, Jennie from A Pocketful Of Polka Dots. The end of this post will have instruction on how you can share your latest post and check out what others are sharing. It is truly a PARTY!!! When you think of parties you think of the holidays, and that brings with it the dreaded question of what am I going to wear? Today’s post is all about scarves and the power they have to change an outfit from boring to FABULOUS. An easy way to change up an outfit is with a scarf. I don’t have many in my wardrobe, but the ones I have are workhorses. This is a simple pashmina scarf from Amazon for $7 and comes in about 20 colors. What to look for in choosing a scarf? For me, because I am petite, I want a lightweight, oblong/rectangular shaped scarf that I can tie or loop close to my face. A cheetah or leopard print scarf is a MUST have for your wardrobe. Animal print is considered the new neutral and it will go with everything. If you are not comfortable with prints, leopard is a great place to start and a scarf is an inexpensive piece to add to your wardrobe. Not sure about leopard? Try plaid! This oblong, lightweight scarf is the BP Plaid Scarf From Nordstrom. It is sold out but the BP Line has tons of great oblong shaped scarves. Here a simple blue cashmere sweater looks complete with a bold but Classic Plaid Scarf in Dark Green from J Crew Outlet. This scarf brings attention to my face and away from my tummy. This is the same Classic Plaid Scarf in Dark Green from J Crew Outlet but worn with my Chenille Fringe Poncho from Chicos. Total different look where it brings out the softer hues in the poncho. Want the scarf to be a showstopper, try it with anything black. Need a new look for the holidays? This is the same Classic Plaid Scarf From J Crew Outlet but in a color called Black Rich Saffron. It has hints of red, green, and blue with a background in black so I have many different outfit options to wear this scarf. Want to get really bold? Try mixing patterns. The leopard print and plaid are an easy duo to mix. The 1901 Leopard Print Coat from Nordstrom is more black than brown and it easily goes with the Classic Plaid Scarf in Dark Saffron. I added a red turtleneck to bring additional color to the outfit. Okay, you really want a fashion statement? Go Faux Fur! Nothing says, Diva, like faux fur. This is the Faux Fur Scarf in black from Target. Added to my leopard print faux fur coat from Fabulous Furs, this scarf not only adds some warmth but with my black sunglasses on gives me a total movie star look. Caution, only wear this scarf if you want to be noticed. Scarves are a great way to get mileage out of your wardrobe. They can change what you thought was a boring outfit, into one of your favorite looks. Lots of scarves out there this shopping season. Check Out Savvy Southern Chic post from last weeks FABULOUS FRIDAY LINK UP and how she is wearing a blanket scarf to mix patterns (stripes & plaid) and add interest to her outfit. Follow me on my social media. I post pics daily on IG and if you like my blog post-Bloglovin’ sends them out when they go live. What is a Link Up Party? It is a place where bloggers/Instagramers can add their most recent post (link up) in one place and check out what others are posting. Kinda like one-stop shopping for inspiration and ideas. How does it work? Simple, we ask that you follow the host and co-host on at least one or if you want all of their social media platforms and add a link to your blog post that tells everyone where you Link UP!. Then go to the InLink Link UP tab and follow the instruction. By linking up you are giving Jennie @ A Pocketful Of Polka Dots the permission to send you a short and sweet email reminder to link up next week and check out your new friends. Meet Our Host! So let’s get started with the party. I would like to introduce you to Jennie from A Pocketful Of Polka Dots. I have been following her for a while now on Instagram. 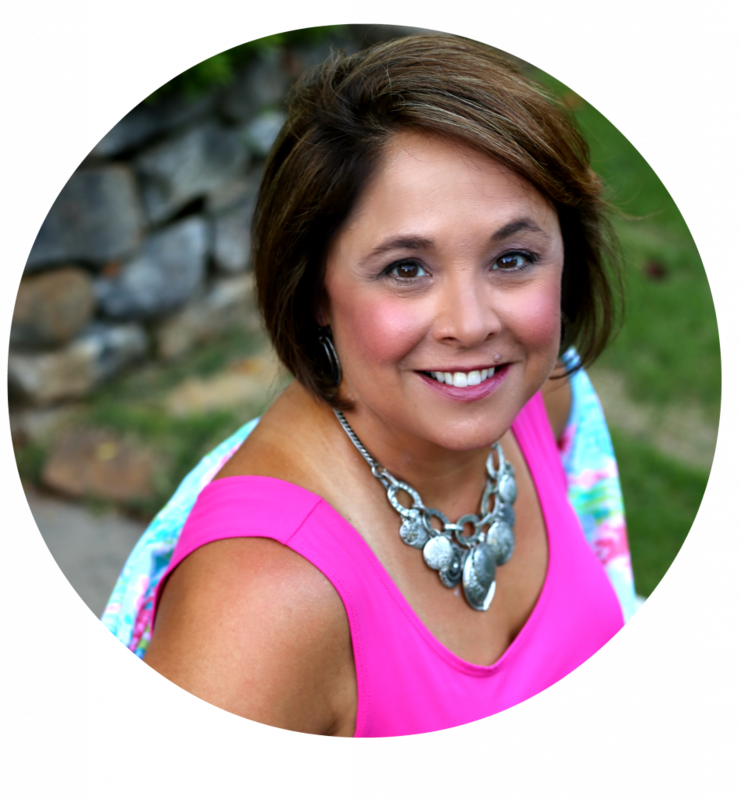 She is a southern fashionista from South Carolina who is embracing midlife with style, grace, and fun! Make sure you read her Fabulous Friday Post and see who she is featuring this week from last week’s link up party. So many pretty choices. I just love the plaid scarf paired with the leopard print coat. I would have never tried that, but it works!!! Hi Regan! What a helpful post, especially for me because I am scarf challenged! Thank you so much! I LOVE all of these! But especially the teal (natty color), the leopard (can never resist leopard) and the J. Crew plaid because of it’s intensely saturated colors! Hope your holidays are off to a fantastic start! You have such a great scarf collection! I’m loving all of the plaids and the faux fur scarf is so fun! I love how you played with your scarves. I used to wear them all the time, then we moved to Louisiana and I thought I’d never wear them again. I was so wrong — it gets cold here. Now I’m going to keep my eyes open for a leopard print scarf. You’re absolutely right, it’s the perfect neutral. A scarf can really add a punch to a look! Love it! Reagan, thank you so much for co-hosting with me last Friday! I love this post and the many looks you shared. So many fab scarves and I enjoyed seeing how they transformed your looks. I adore the leopard and plaid mix!